On a Roll is one of Mona's microgames in WarioWare: Twisted! The name is a parody of the saying "I'm on a roll! ", when someone is winning. 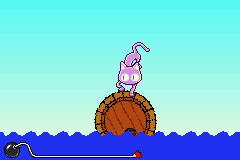 The purpose of the game is to balance the cat on a round object to prevent it from falling into the water. If the cat falls in the water, the game is lost. 1st level difficulty: Balance on a large barrel. 2nd level difficulty: Balance on a small tire. 3rd level difficulty: Balance on a very small soccer ball.